Measurement Rentals offers for hire, the Agilent 33522B precision 2-channel 30 MHz function/arbitrary waveform generators. 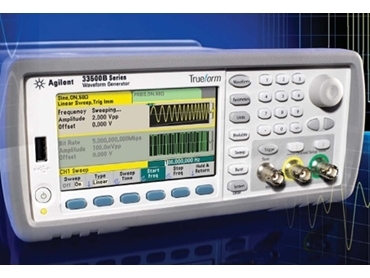 In addition to common signals and features such as modulation, sweep and burst, the 33500B Series waveform generators use Agilent’s Trueform technology to offer a new alternative that blends the best of DDS and point-by-point architectures, giving the benefits of both minus the limitations. Trueform technology uses an exclusive digital sampling technique that delivers unmatched performance and signal quality. The Agilent 33522B waveform generators will easily add noise to the signal for margin and distortion testing using only a single channel. The user can create dual-tone multi-frequency signals on either or both channels. The two-channel model can be used to sum and combine up to four signals. The variable-bandwidth noise feature of the waveform generators allows the user to adjust the bandwidth of the built-in noise generator to control the frequency content of the signal. Measurement Rentals offers a wide range of test and measurement equipment at daily, weekly and discounted monthly rates.